Sad but true, there has to be some way to shut this down. Yep, close the border and send the people home. Tell them to submit their papers for asylum to the US Embassy in their home country. Consider the applicants on a case-by-case basis, PERIOD! NOBODY with any sense believes these people are coming here for “asylum,” jbscpo. That is only the EXCUSE for this MASS ASSAULT on our national sovereignty! In fact, some of the “caravan” participants said, when interviewed, that “applying for asylum is a waste of time.” You noticed they REFUSED Mexico’s offer of asylum and jobs? That’s the SAME thing the MUSLIMS did when they invaded Europe, and were hellbent on flocking to the countries with the BEST welfare benefits. They’re not here for “asylum.” They are here for the FREE RIDE on the backs of American taxpayers that they were PROMISED by the GLOBALIST SCUM like SOROS and his conniving pals in the UN, who recruited, organized and FUNDED this HOSTILE INVASION. JB. Since they went THROUGH 2 countries before getting here, and REFUSED refugee status that should automatically NIX any chance of claiming asylum they had.. There is a way to shut this down. We need to start watering the Tree of Liberty. There is. First, ERASE the pernicious changes Obama and friends made to the immigration laws concerning “asylum.” Second, make it ILLEGAL for ANY non-citizen of the United States to draw ANY KIND of America-taxpayer funded WELFARE benefits, free medical care, etc. If you stop FEEDING THEM, they will go away–just like ANY stray animal hanging around your doorstep looking for a free meal! And THIRD, throw ALL the America-hating, conniving COMMUCRATS who are enabling and ENCOURAGING this BS OUT of office! AND it’s high time to start going AFTER soros and his money. This cartoon is right on target. Soros and his fellow power-mad GLOBALIST pals in the UN, are trying to do to the US–with Central American “caravans” which THEY have recruited, organized, and funded–what they have ALREADY done to Europe with MUSLIMS. 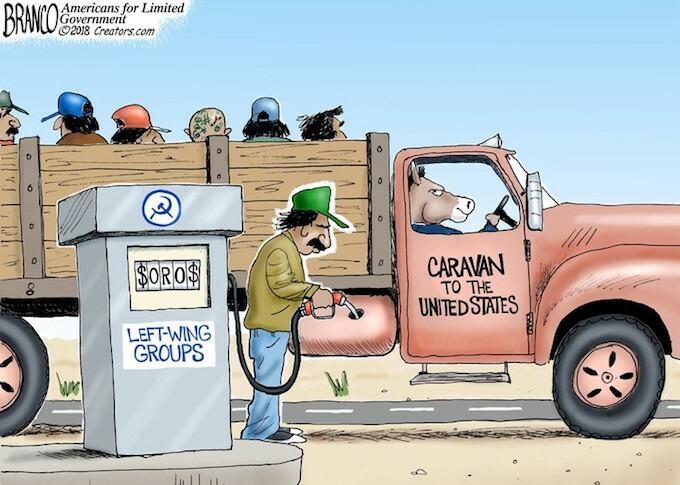 These “caravans”–both the one already massing on our southern border–and OTHERS being organized and launched as I write this–are a MASS INVASION and an act of WAR aimed at the HEART of American sovereignty, and unless we want to become just another Third World vassal state in the Globalist collective of Soros’ MAD DREAMS, we had BETTER stop them from getting in! Why is no one talking about militant Marxists Cloward & Piven? They are the reason Soros & co. are funding the C.A. invasion forces. These Alinsky disciples promoted the clandestine effort to overload our welfare system to the point of collapse. Once it collapses, they would “come to the rescue” with their communist alternative to our failed Republic.